When I try to explain to people what having galactosemia means for Oliver, especially for the first time, one of the easier aspects to explain is that he is required to have a restricted diet and, in particular, can not have any dairy products. If this were the CliffsNotes explanation of galactosemia, you could file this under the Major Themes section. It’s one of the easier aspects for others to understand considering the number of children with food allergies and other aversions these days. Curbing accidents – By keeping products Oliver can’t eat out of the house, we are hoping to statistically cut down on the chances of him having an “oops” moment at home. We are realists so we’ve resigned ourselves to the idea that at some point, he will probably have an accident. Maybe another well-intentioned parent will accidentally offer him a cookie or he will reach onto a classmate’s plate and steal a cheese puff (because, seriously who can resist? ), it’s bound to happen at some point. In the US, dairy is so pervasive it almost seems inevitable. If we can cut down those odds even a little, then it’s worth it to us. Economic impact, part 1 – Groceries are expensive, especially if you like to shop the outside of the store like we do. Fresh produce, meat, fish, and dairy (and the dairy-free products in that department) can add up quickly. Add to that snack foods and other packaged products, the idea of buying two of everything–one Oliver can eat and another he can’t but maybe we are used to buying–is enough to have me consider taking on a part-time job. Visions of a fridge and pantry packed with two versions of most everything, seems like such a waste. Economic impact, part 2 – I am a big proponent of my voice, my dollars, and my internet “clicks” being valuable commodities. I believe that as a consumer, my opinion and needs should matter to the businesses I support and if I find myself in a position where they don’t, then I have the luxury of moving on. We looked at our decision to go from buying for a single person in our family with special dietary needs to a family of three as hopefully a bigger statement to food-related businesses on the need for dairy-free food products and explicit labeling. Health? – I put a question mark after this one because quite frankly I think the jury is still out as to whether animal-produced dairy products are good for you, bad for you, or somewhere in between. Like eggs, coffee, red meat, and wine, there seem to be new studies and advisories every year. 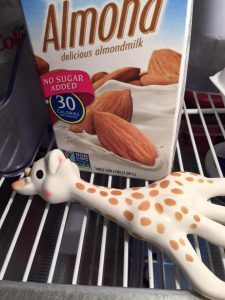 What I do know is not having dairy in his diet won’t hurt Oliver and it is absolutely possible for him to have a well-balanced, healthful diet without it. Second nature – By going dairy-free ourselves, John and I will find ourselves each and every day making decisions like Oliver will on what he puts into his body. We’ll have to ask questions, do research, and have back-up plans and hopefully, by doing that now, we will be able to help him better make decisions for himself and give him the ability to navigate the world confidently. We have faced mixed reactions when we tell people, but one of the recurring reactions is, “I could never do that! I love cheese/chocolate/butter/fill-in-the-blank too much!” And had you asked me a year ago, I would have probably said the same thing. But honestly, once we made the decision, it really was like flipping a switch. We are so thankful to live in a time and place where we can find alternative versions of most everything! I can’t say this is a decision for everyone, but for us it definitely feels right. **If you are looking for an AWESOME resource to get yourself started or to learn more, Go Dairy Free is my go-to! Great recipes, advice, information, and product reviews!